You are currently browsing the archive for the Turkey category. For those (in Turkey) who can afford it, the first small cup of kahve is enjoyed on rising, the second cup is drunk mid-morning, and a third may be drunk after a long meal. As it is more expensive, and more prestigious, than tea, coffee is not available to all on a daily basis. In some Anatolian communities, where it is reserved for special occasions, there still exists the tradition of selecting a suitable bride partially based on her ability to prepare and serve coffee, while the prospective mother-in-law and her son inspect the young girl’s beauty and grace. The traditional cooking vessel for Turkish coffee is a cezve, a slim, deep pot, often made from tin-lined copper, with a long handle. Generally, medium-roast Arabica coffee beans are passed through a very fine grinder until almost powdery. A wide selection of suitable coffee beans are available in health food stores, supermarkets and delicatessens, but the Turkish setting on the grinding machines usually doesn’t grind the beans fine enough for the desired effect, so make sure it is passed through the grinder twice. 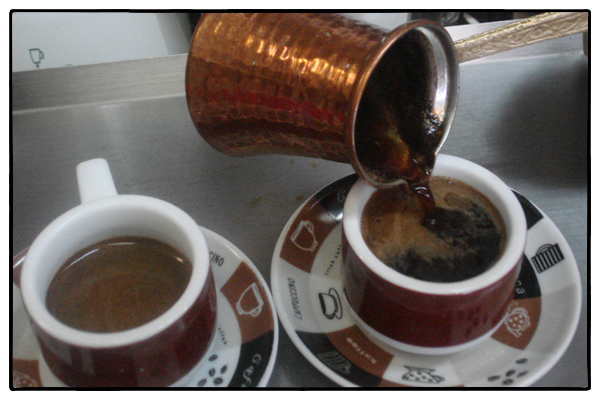 Most Turks drink their coffee sweet, but you can drink it sade (black), orta sekerli (medium sweet), or sekerli (sweet). There is an art to making an acceptable cup of Turkish coffee. To make the coffee, measure the water by the coffee cup (a standard, small cylindrical cup) and the coffee by the teaspoon. The general rule allows for one coffee cup of water to 5ml/1 tsp coffee and 5ml/1 tsp sugar per person. 1 Tip the water into the cezve and spoon the coffee and sugar on the top. Use a teaspoon to stir the sugar and coffee quickly into the surface of the water to give the desired froth a good kick-start. 2 Put the pan over a medium heat and using the teaspoon, gradually scrape the outer edges of the surface into the middle to create an island of froth. The key to achieving the perfect froth is always to work at the surface; never touch the bottom of the pot with the spoon. 3 Once the coffee is hot, pour about one-third of it into the coffee cup to warm it and return the pan to the heat. Continue to gather the froth into the middle and, just as the coffee begins to bubble up, take it off the heat and pour it into the cup. Leave the coffee cup to stand for one minute to let the coffee grains settle and then drink it while it is hot. The other day I was writing about the Friday farmers’ market in Bodrum and how I came across these incredible dried figs stuffed with sesame seeds and almonds (which didn’t last long once I got back to my hotel room). Well, a friend forwarded to me a very simple recipe for making these yummy goodies. 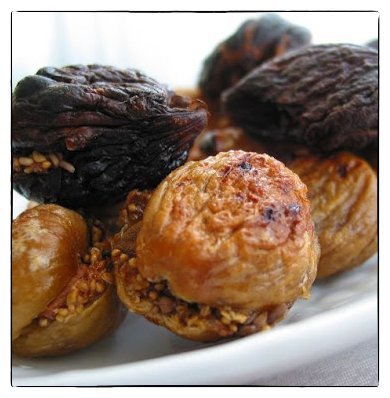 The most important thing is to buy really good dried figs—don’t skimp. Then you use a sharp paring knife to slice the figs in half, without separating them all the way through, dip them in a plate of sesame seeds, both insides, and then slide an almond (or walnuts work as well) in between the two halves, like a sandwich, and close them back up. Put the figs on a cookie sheet lined with parchment paper and bake at 350F for about 10 minutes. Let them cool and then try real hard not to eat all of them in one sitting like I did. I think these would also make an excellent simple dessert, perhaps served with a glass of port. Or added to a cheese plate. Or…. The Turks put pomegranate juice in everything—including this wonderful cocktail I discovered at a swank little bar in Bodrum. It’s called a pomegranate caprioska, a caprioska being something like a vodka daiquiri (limes, simple syrup, and booze over crushed ice). 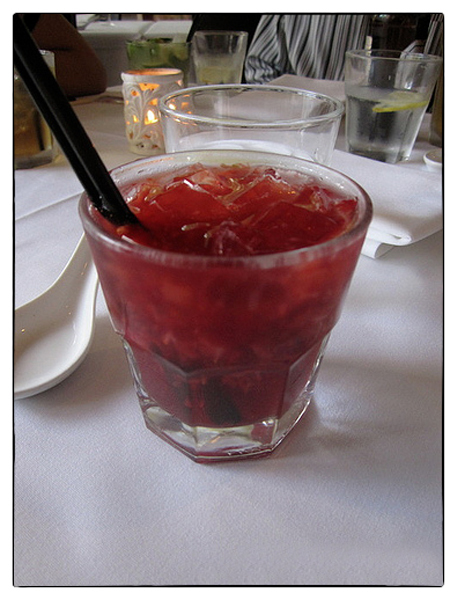 I like this version which adds a couple of tablespoons of pomegranate juice to the mix. It’s also a prettier version than the original. And perfect for summer. Place all but one of the lime wedges in a cocktail shaker with the vodka, pomegranate juice, and simple syrup. Muddle the ingredients, then add crushed ice and shake well. Strain into a lowball glass filled with crushed ice. Garnish with remaining lime wedge. The pool at the Bodrum WOW Resort. Photo by David Lansing. I haven’t talked at all about where I’m staying in Bodrum. It’s called the WOW Resort. WOW stands for World of Wonders. Is it a world of wonders? Perhaps. Certainly there are enough Brits and Germans here who think so. I think the “wow” part for them is that it’s an all-inclusive resort so they can drink and eat until they’re sick (which I’ve seen several do). 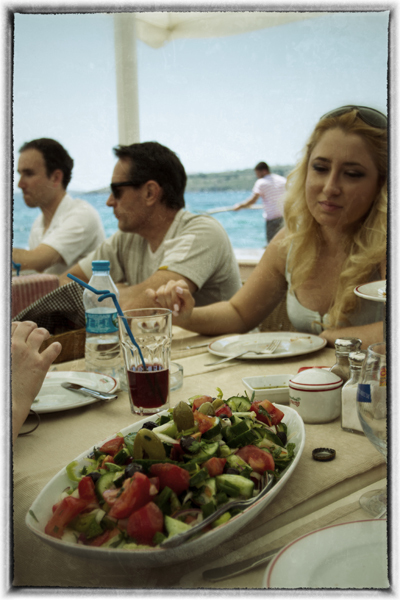 Positives: It’s a beautiful setting—right on the Bay of Gümbet. 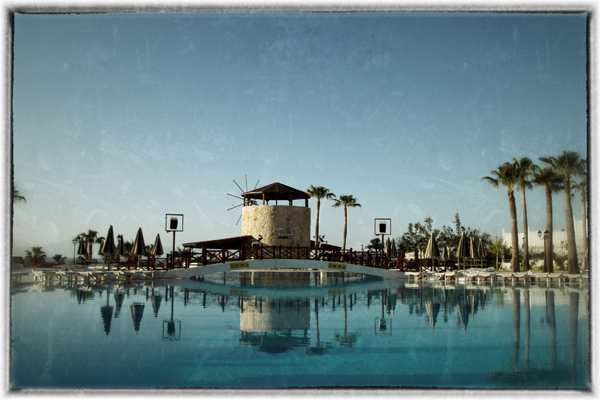 Large, beautiful pool with a café and bar housed in a faux windmill at one end. Nice beach just down the hill. Nice tennis courts. Simple but clean rooms with little balconies facing the water. And an open bar. Negatives: Buffet food. And an open bar. Go for the salad and not the meatballs (or fish) at Bodrum's Sultanahmet. Photo by David Lansing. “Where do you want to eat?” Sidar asked me. It was sometime after one and I was more thirsty than hungry. “I know a place,” he told me and began to walk quickly through the narrow streets of Bodrum. Did he really know a place? I don’t know. It’s hard to say with Sidar. He always marches off as if he knows exactly where he’s going but usually when he picks a restaurant, it seems to be a bit happenstance. Like walking down a street where you know there are lots of coffee shops but you don’t have a particular one in mind. “This place is good,” he said, standing outside the Sultanahmet Koftecisi restaurant. Kofte is the Turkish meatball. I was thinking more like fish. “Meatballs?” I said. It was a beautiful setting: On the beach facing the Bodrum Castle. But the menu seemed a bit odd: Chateaubriand, beef stroganoff, chicken curry, schnitzel, carne asada. “What about fish?” I asked our waitress, the wife of the cook. I was not going to have meatballs. And I wasn’t at all sure I felt like iskender kebab, a kind of döner kebab made from thinly sliced lamb or beef basted with hot tomato sauce and served over pieces of pita bread slathered in melted sheep butter and yogurt. Not the kind of thing I usually go for when it’s 90 degrees out and I’ve kicked off my shoes to wiggle my toes in the sand. Instead, I went for the usual meze—humus, smoked eggplant and pepper, stuffed grape leaves—and a big shepherd’s salad (coban salatasi) with chopped tomato, cucumber, onion, and peppers. Much better than meatballs.